As elusive in life as she was in death, Elizabeth Short preferred the company of strangers, made no close friends in her short adult life and was out with a different man each night. She was one of the most publicised and puzzled-over murder victims of the 20th century. 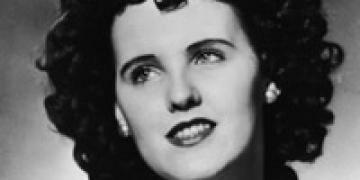 Short, thought to be an aspiring actress better known as the Black Dahlia, was a victim of a gruesome and unsolved murder at age 22. Elizabeth Short was born in Hyde Park, Massachusetts. Her father, Cleo, abandoned his large family in October 1930, feeling unable to support them after the 1929 stock market crash left him bankrupt. Short and her four sisters were raised in Medford, Massachusetts by their mother, Phoebe Mae. Suffering with asthma as a child meant that Short spent her summers in Massachusetts but went to family friends in Florida for the warmer winters. At age 19, she moved from her hometown and went to live with her father in Vallejo, California, hoping to pursue her dream of being in the movies. In early 1943, they moved to Los Angeles and she managed to get work in the Camp Cooke Post Exchange (now Vandenberg Air Force Base), near Lompoc. Short didn’t stay long and left after a fight with her father, moving to Santa Barbara. It was here that the Juvenile Authorities arrested her on 23 September 1943 for underage drinking and sent her back to Medford. Over the next few years, she moved around Florida, occasionally going back to Massachusetts for visits. Short predominantly earned money by working as a waitress at various restaurants but was often short of money. Her glamorous image and good looks meant that she was never without doting admirers who would pay for her meals and buy her clothes and gifts. Short’s exact movements during this time were later documented in the Los Angeles County district attorney’s files. They contained a detailed account of her whereabouts – both living and working – from September 1943 to the early months of 1946, entitled ‘Movements of Elizabeth Short Prior to 1 June 1946’. Ray Krone was a patriotic American who served in the air force and was working as a mailman when he was convicted of murder. People who knew her, described Short as courteous and soft-spoken, a woman who didn’t smoke, drink or swear and who aspired to appear glamorous. Her lust for life meant she frequented nightclubs, loved the music and was always surrounded by men. During her time in Florida, she met Major Matthew M. Gordon Jr. on 31 December 1944 at a New Year’s Eve party and they fell in love. He was part of the 2nd Air Commandos and involved in training for deployment in the China/Burma/India operations. Whilst in India, Gordon wrote to Short, proposing marriage. She eagerly accepted but he sadly died on 10 August 1945 in an airplane crash before he could return to America. It was later erroneously reported that the couple did in fact marry and had a child who died. Gordon’s family denied any connection between him and Short, following her murder a few years later. In July 1946, Short visited Long Beach, California to see an old boyfriend, Lt Gordon Fickling whom she had met in Florida during the war and with whom she had kept in touch. In the six months prior to her death, she moved frequently, living variously in rooming houses, hotels, apartments and some private homes. She never stayed longer than a few weeks before moving again. She was known to have shared a cramped, two-bedroom apartment with eight other young women, in Hollywood from 13 November to 15 December 1946. Fickling’s last letter from Short was dated 8 January 1947 (a day before she was last seen alive) and in it she told him she planned to move to Chicago to become a fashion model.